Prasad A. 2012. Communal nesting for synchronization of breeding activities in the weaver bird (Ploceus philippinus L). Ecoscan 1: 73-76. Abstract. Successful survival of a species is a measure of its ability to breed at the time of the year when environmental conditions are most conducive for achieving reproductive success. Prior to the nesting phase, the weaver bird (Ploceus philippinus (L)), a seasonal breeder, socially organize themselves so as to synchronize their breeding activities. Communal nest building activity is a part of the courtship in this bird species as the prospective female birds are not attracted until the male weaver birds establish their nesting territories and start building nests. Moreover the onset of song production by male weavers has mutual influences upon one another which may stimulate the development of sexual behaviour required for culmination of breeding events. The breeding colony is a function of its size and an adequately high number of individuals are essential for the establishment and maintenance of the colony. The percent nesting success in a larger colony is greater than the smaller colony which suggests that the size of the colony is an index of breeding success. Photo (left): Baya Weaver nest, from phown 2825. This study was carried out on four selected nesting colonies of different sizes of the Baya Weaver in the Tata Steel Zoological park, Jamshedpur (22Âº48' N and 86Âº11' E), India. 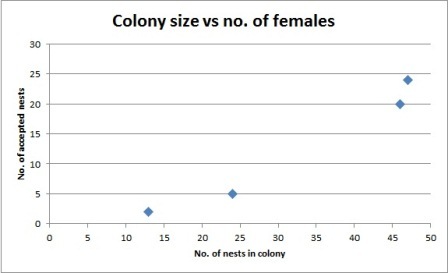 The author found that a higher percentage of nests were accepted by females in larger colonies, than in smaller colonies - see figure (right). Also, the average percent of time spent in weaving nests per hour by the male weavers was higher in larger colonies than in the smaller colonies. Download a pdf of this paper here and read a summary of breeding by the Baya Weaver here.